Bering Yachts is pleased to announce a new order for a 32 meter semi-custom yacht new 106 model with the contract signed during the Monaco Yacht Show 2018. Like all Bering yachts the 106 is able to cross the ocean, providing maximum safety and modern comfort with fuel efficiency. With Bering one can cruise to many destinations, including those which cannot be reached by representatives of similar class of yachts. 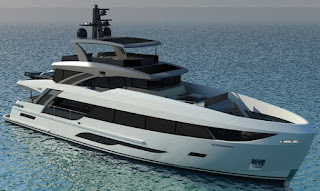 Bering 106 will be a triple deck super yacht with a distinctive European modern look. The Bering 106 will have speeds up to thirteen knots, while a fuel capacity of 30,000 liters should allow for a range of 4000 nautical miles at a cruising speed of nine knots.